Reusable Baby Food Pouch (4-pack) for Homemade Baby Food. Squeeze Pouch Is Great As a Food Container and for Food Storage. Simple solution to giving your kids healthy homemade foods. Fill reusable pouches with purees, smoothies, yogurts or applesauce. Get your little ones to eat their vegatables by sneaking some into a puree. More ease and less mess. Portable and compact making it great for on-the-go. Kids can feed themselves with less mess than spoon feeding. Economical: store-bought food pouches are expensive. 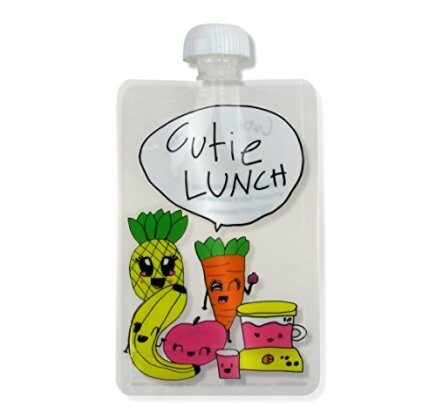 Save money with Cutielunch reusable food pouches. Whether it's making a large portion of food, or buying the larger containers of yogurts and applesauces, you'll be saving time and money. Environmentally responsible: reusable pouches don't end up in landfills. No BPA, lead, phthalates or PVC. Low impact packaging. Perfect for homemade baby food storage.